Weight: 4.42 ct; size: 10.19 | 10.18 | 7.45 mm; shape: square cushion; colour: colourless; clarity: eye clean; cut: excellent; treatment: none. Very clean specimen; design ‘Quadrille’ by Edith B. Strout, excellent cut by Tan Pen. 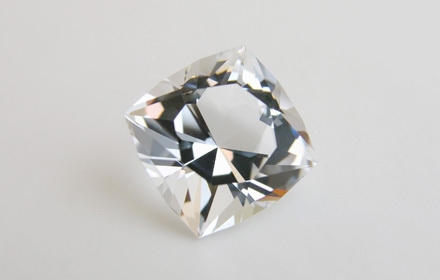 A transparent colourless variety of quartz. None of the specimens illustrated in this site is on display in the permanent exhibition of the National Museum of Natural History, Sofia.